IELTS stands for International English Language Testing System is a recognized form of language testing for immigration, work or study purposes in Australia, Canada, New Zealand, and Singapore. IELTS recognize the language proficiency of persons who want to study or work in countries where English is used as a language of communication. It is an exam conducted for non-native English speakers. 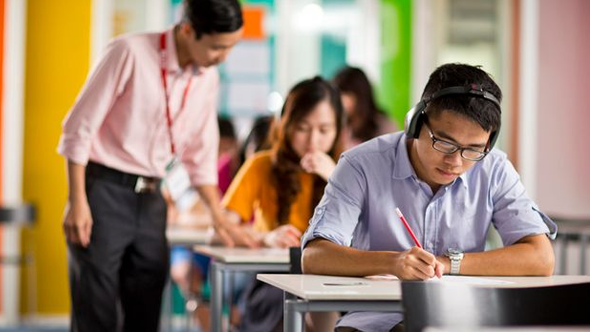 IELTS tests are necessary if you are applying for a job or to study in a college or university in an English-speaking country or if you are migrating to such a country. IELTS exam is conducted worldwide by the British Council, UK and IDP, Australia. IELTS test is divided into 2 modules – Academic and General. The Academic Module is for future students who are applying for higher education or professional registration in English speaking countries and the General Module is for immigrants. IELTS is accepted by thousands of organisations in over 135 countries. If you are preparing for IELTS then Lead Education is the best coaching Institute to get career guidance so that you can score high marks in the test. We have appointed a team of highly skilled instructors and professionals for providing IELTS Coaching for IELTS students. Lead Education is one of the best IELTS Coaching Institute in Chandigarh who gives coaching to the people to pass their IELTS test with good Band score. With our experience and expertise IELTS, we help students to qualify the IELTS test. Lead Education provides the Best IELTS training in Chandigarh, IELTS course in Chandigarh, IELTS practice test in Chandigarh, IELTS test preparation in Chandigarh, IELTS institute in Chandigarh, IELTS study material in Chandigarh, IELTS coaching centre in Chandigarh, IELTS preparation material in Chandigarh, IELTS training centre in Chandigarh, IELTS exam material in Chandigarh, IELTS coaching classes in Chandigarh, IELTS exam coaching in Chandigarh, IELTS training institute in Chandigarh and IELTS coaching institute in Chandigarh. We have our institute at Chandigarh, Mohali, Panchkula, Bathinda, Moga, India and Adelaide, Australia. How Does Lead Education help you to Migrate? We offer training for both Academic and General Modules of the IELTS test. The most effective and interesting way of learning is practised at our centre of IELTS coaching in Chandigarh. Our training programs are designed using the expertise and experience of British Council trained faculty with a focus on testing pattern and diversity in the mindset of different students. We offer personalized attention, initial evaluation, audio-visual inputs and mock test in the form of teaching methods to our students. Language labs give exposure to the real-time testing environment to the students. Why IELTS at Lead Education? Quality learning experience with expert teachers.